Katherine Heaton ’16 was the 21st student from the University of Redlands in eight years to receive a Fulbright award—considered the highest and most competitive awards for overseas research or teaching from the federal government. Before Paris, and before Redlands, Heaton applied to 27 outside scholarships and received 13. 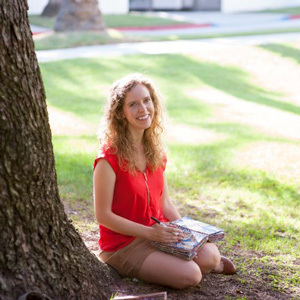 The beautiful campus, small class sizes and accessibility to professors won her to Redlands, where although she was previously “certain” she wanted to go into the special education field, taking classes opened her eyes to other areas. She ultimately majored in both sociology and French. The University of Redlands has been recognized as a “Top Producer of Fulbright Students,” most recently in the 2015-16 academic year. The University’s 21 Fulbright Students have traveled to France, Germany, Mexico, New Zealand, Guatemala, Norway, Spain, Japan, Morocco and Taiwan—10 to conduct research and the other 10 to teach. Their majors include global business, international studies, languages, biology, communicative disorders and music.